What is in this XML tutorial? Why do we need a separate language for data storage? That is a concept you need to understand before learning more about XML or the many ways to store and transport data on the web. You might be an experienced programmer or new to development; if you have worked with more then one language at this stage you must have noticed that there are many similar things between them, but even more that just aren't the same. Another problem is how information is stored in general so that the it can be shared between more then one application? It must be out of the scope of the application to do so, and XML is a great option. Before we start our XML tutorial and become XML masters, let's take a quick step back to understand the context. 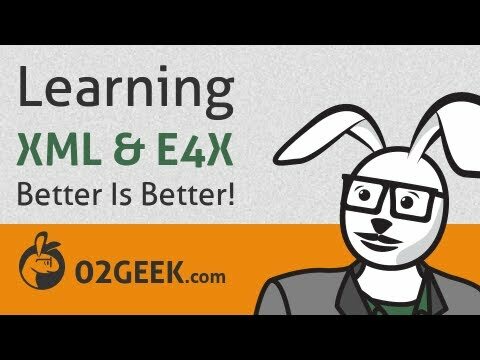 XML sounds like HTML.. well, not really but it does have that ML part in it and it's not serendipity! The same organization created it: the W3C. Although XML was born after HTML (way after) it wasn't created to replace HTML. The creators of HTML noticed that HTML has a lot of very powerful features from layout, organization and interactive powers but as the web was evolving, it seemed like a smart move to separate some of these elements. Who cares about history? What matters is what is happening now! So XML is a byproduct of HTML XML is where we prefer to put content that needs to be organized. Since its creation, XML has become a very popular option for data storing. So in the most simple terms, XML is not a replacement for HTML but was created to store/transport data in a data-focused way. No clutter of nodes that have visual meaning %u2013 it's all about structure, while HTML was designed to showcase data visually. HTML=showing data , XML = storing data. While HTML nodes do things (a <b> tag will bold what ever is inside it,) XML is just a data bucket with no information that has a visual reference: it's just "nodes." Although XML originated from a need to separate data, it has been widely embraced by all programming languages as a means to store/transport data. Since the early days it was a big hit. You'd be surprised to know how deeply this technology is involved with most of what we do online: mobile, desktop. you name it %u2013 XML is there, many times with other file extensions to hide them. XML is one of the most common data storage technologies, being ideal for a small set of data that doesn't change often, such as configurations, RSS feeds and such. There are many other storage technologies that we should explore such as databases and JSON.